Finding the right monumental masons to create a fitting memorial for your loved one can seem to be a difficult task, however the importance of getting it right to create a lasting memory for your family cannot be underestimated. Read our guide to find out the best ways to get started. We will make sure that we support you through the process, so that your memorial is designed and crafted to your wishes. Giovanni Verga Memorials fully understand how important it is to you. We make sure that we support you through the process, so that your memorial is designed and crafted to your wishes. We have the experience and knowledge to help you create a fitting memorial worthy of your beloved family member. We are here to help with your specific requirements. to help design a fitting memorial for your loved one. 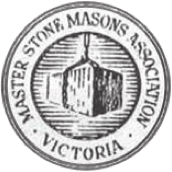 We are also members of the Master Stonemasons Association of Victoria. All our work is carried out with your peace of mind as our priority. Master Stone Masons Association Victoria Inc.
As members of the Master Stonemasons Association of Victoria, we have proven our skill and craftsmanship. The team continue to take the greatest pride in delivering on craftsmanship, quality and value for every customer. We care about each one of our customers and provide a unique and individual service. Here’s what some of our customers had to say about their experience with Giovanni Verga Memorials Melbourne. We would like to express our sincere gratitude and appreciation for all your efforts. You were able to fulfill all our wishes and have created something very special for our beloved dad. We could not have gone with anybody else. We will forever appreciate your sensitive, patient, and gentle dealings with us. Many thanks. I would like to sincerely thank you for the lovely monument for my dad. Most of all, I am very grateful for your understanding and compassion with the financial situation. I wish you and your family to be blessed with good health, and happiness. We, Mrs. Margaret Annetta and family, wish thanks to staff for a lovely headstone for Michael Annetta. Well done. We craft a wide variety of designs for all types of monuments including chapel, double, single and lawn monuments including plaques. Accredited by Master Stone Masons Victoria Inc.